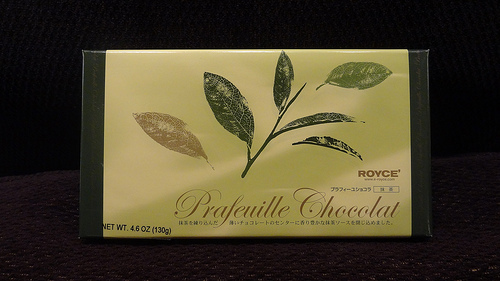 This is the first of two products I will be reviewing from the Japanese chocolatier Royce, whose store I discussed here. I purchased this because its’ one of the few products sold in the US which is flavored with real green tea powder. Each of the 30 chocolate wafers is individually wrapped and stacked in 6 bins. I’ve noticed this type of packaging is pretty common in Japanese candies, and has the advantages of maintaining freshness and cleanliness, in addition to adding to the ‘gourmet chocolate’ feeling. On the other hand, it contributes to extra waste and adds time to the process of eating each one. Opening one of these little packs reveals a light green candy in the shape of a perfect square. It’s slightly larger than a quarter and has name ‘Royce’ printed across several times diagonally. It’s also extremely thin, surely the thinnest chocolate I have seen in my life, roughly three or four times shorter than your average chocolate bar. Before you take a bite, you may notice a buttery smell reminiscent of white chocolate, with a definite note of green tea. The flavor and texture are also very similar to white chocolate, again with a subtle taste of green tea powder, almost what I would call an aftertaste but nevertheless the real thing. Inside each thin wafer there is an even smaller portion of “maccha sauce” (translated directly from the Japanese text inside the package), which is basically like a maccha-flavored jelly with an extra touch of sweetness. The practically microscopic size of this jelly makes it difficult to appreciate, however. In one serving (7 pieces / 30 grams), there is 180 calories, half from fat, and 11 grams of sugars. This amount of sugar roughly corresponds to a chocolate with 60% cocoa. This product is essentially a white chocolate, and therefore does not contain cocoa solids, only cocoa butter. Unfortunately this means it also lacks many of the antioxidant properties of dark or semi-sweet chocolate. The ingredients are fairly commonplace, and not particularly unhealthy, except for “artificial flavor” which is even worse than my pet peeve “natural flavor”. I generally try to avoid any artificial flavors, which are basically chemicals cooked up in a lab which try to simulate the taste of real, organic substances. The composition of these compounds could technically be the same as their organic counterparts, however they were created via some form of chemistry magic, so cannot be considered “natural”. While Royce does a good job putting out a high class chocolate image, its clear they are not catering to the health-seeking crowd, with artificial flavorings and no other special qualifications (organic,vegan, etc.). In America, this is only officially available via one of their two (soon to be three) New York stores, where it sells for $18. You may be able to find third parties importing it from Japan, but there is usually a very high mark-up, on the order of 200%-300%. Royce has put great effort into the appearance and packaging of this product, but the taste itself is basically white chocolate with some green tea powder added in. Artificial flavors, plus a high price, makes it hard to recommend it for most people except green tea fans who are more likely to appreciate the flavor.